It seems that market-leading slots developer NetEnt up upping the frequency at which they launch their slots titles. 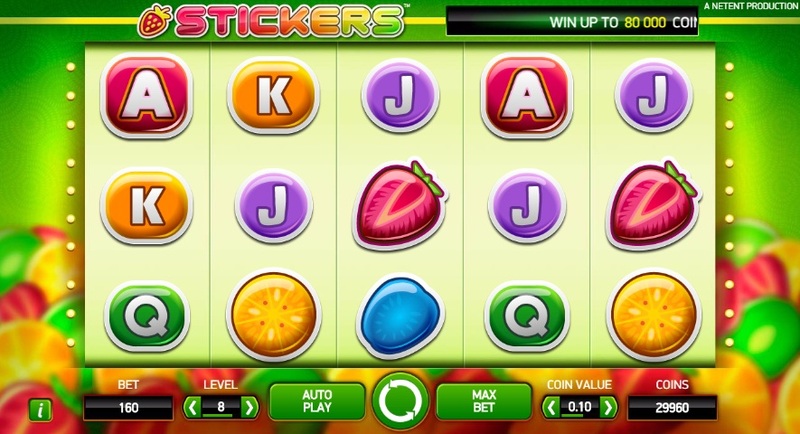 Stickers is the latest off the NetEnt conveyor belt and it certainly has a deja vu feel to its theme with fruit taking on a focal point on the reels. 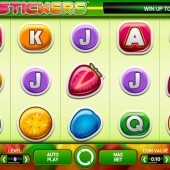 Stickers is a 5 reel, 20 payline slot that is based on different types of fruit. The reels are set against a backdrop of fruit stacked up and fruit represents the symbols across the reels. If you think you've seen this before then you'd be forgiven for thinking that with NetEnt having already launched previous slots such as the fruity-themed Fruit Case and the rather underwhelming Fruit Shop. The reels are jam-packed (forgive the fruity pun) with fruit symbols. There are strawberries, oranges, kiwi fruits, blueberries, and the regular 10-through-to-Ace symbols that come in different colours too. The Wild symbol is represented by a Wild icon set against a red spade symbol. It substitutes for all other symbols on the reels to complete potential winning combinations. When the Wild appears on the reels it acts as a Sticky Wild and awards one Sticky Spin. This Sticky Spin feature is the main draw for this slot and is where the slot gets its name. For every Wild that appears you get a Sticky Spin. On each Sticky Spin, the Wild will remain as a Sticky Wild for the duration of these Sticky Spins. So if you hit three Wilds across the reels on a spin then you will get 3 Sticky Spins with the Wilds remaining as Sticky Wilds for those 3 spins. Sadly, that is it for this slot. I suppose you can't expect much more from a slot called Stickers. My initial hope that it was based on those stickers you'd collect as a child were quickly destroyed but then when I saw the NetEnt teaser trailer I was mildly excited. However, having now played the game I am quite disappointed in the lack of depth in this slot. I can't help but feel this slot is simply a stop gap for NetEnt after they launched their big budget Dracula slot. It is possible to win up to 80,000 coins but good luck with that!